Often referred to as the 'place where Noah parked his ark', Gorongosa National Park was a popular tourist destination for the rich and famous back in the 1960s. During this time, the region's abundant wildlife attracted stars like John Wayne, Joan Crawford, and Gregory Peck. The subsequent years of war and poaching decimated the wildlife count, with programmes implemented to restore the park to its previous star status as one of the richest wildlife refuges on the planet. 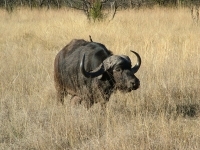 Dominated by savanna and grassland, Gorongosa has a variety of terrain. Along with woodland and impressive limestones gorges, with lush rainforest covering the slopes. The park now includes the verdant Mount Gorongosa, source of the life-sustaining rivers that traverse the reserve. The mountain is sacred and features prominently in traditional folklore. Even after 17 years of civil war and extensive poaching, the Gorongosa National Park still supports astounding biodiversity and wondrous beauty. Experts have documented 398 bird species, 122 mammals, 34 reptiles, and 43 amphibians. Comfortable lodgings are available for visitors, and game viewing highlights include elephants, buffalo, lions, crocodiles, and zebra. Transport: There are traversable roads to the park from both Beira and Maputo, but it is advisable to make this trip in a 4x4 vehicle. Opening times: Park is closed between mid-December and mid-April.